The Fastback 20 from Powis Parker is a perfect binding machine for copy shops, financial institutions, government agencies, or educational environments. It will produce excellent results at a very low cost, whether it's binding presentations, yearbooks, or important documents. Designed with performance and convenience in mind, the FB20 is virtually maintenance free and very easy to use thanks to the user-friendly, one-touch LCD display. The multipurpose machine will handle both tape binding and hardcover book binding, detecting which type of binding strip you are using automatically. Plus, this Powis Parker system is also eco-friendly, continuing the company's focus on greener manufacturing methods and materials. Order this high quality Fastback 20 machine to receive an informative DVD created by MyBinding. The DVD includes a guide on the fastback system, functions, and how to tutorials. Includes an informative DVD created by Mybinding. Spine Lengths: Max. 12" (30.5cm) (A4); Min. 6" ( 15.24cm). Binding Time: 13 to 20 sec. What an incredibly wonderful machine. A true time saver and polished looking presentation product. We love it! This machine impressively and quickly binds documents to look professional and clean. So much better than the spiral binding we were doing before! It is quick, it is simple to use! This product is AWEsome! It is ready to use quickly, is fully automated, intelligent, flexible (binds different widths), and is build to bind all day long, year after year with nearly no maintenance. Initial investment is high, but it pays for itself in our case. Wide variety of different glue strips available; solids, photos, narrow/medium/wide, even preprinted with an inkjet printable area for the label or preprinted with a company logo. Typically takes about 10 seconds to bind each ""book"". Beats the heck out of punching and combs or spiral binding. Awesome machine. The books look great and it is easy to use. Transcript: This is the Powis Parker Fastback 20—a thermal tape binding machine—oh but it’s so much more! Through a simple interface, the machine walks you through the process….Insert you project into the machine and it will tell you what sized binding you will need. The fastback 20’s primary use is with these super strips, they slide into the right of the machine in which the machine then knows what kind of strip you put in—the glue is creative made as a type of barcode. This is the Powis Parker Fastback 20—a thermal tape binding machine—oh but it’s so much more! Once your project is complete, set it in the cooling rack for a short time and it’s complete. It can bind up to 350 sheets using the widest super strip. What’s even better is that maintaining the machine is easy. With easy access to the inside you can clean the thermal unit, clear a stuck strip, and you can even update the firmware of the machine so it’s always keeping up with industry standards. Of course, it does more than a simple soft cover book. Using other Powis products you can achieve hard cover books, perfect binding, make your own notepads…and more. You can even print your own super strips! Bind any type of project has never been easier, than with the Fastback 20. Hello and welcome to MyBinding video. 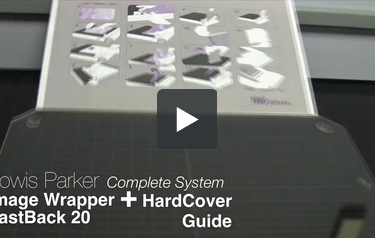 Today we look at the 3-part system by Powis Parker to make your own hardbound books. First, the Image Wrapper; second, the FastBack 20 and then finally the HardCover guide – all 3 of them to bind yourself a hardcover book. First up is the Powis Image Wrapper. With it you measure out, cut, stick and press a fantastic cover that you’ve designed, both inside and out. After you have you image wrap cover, you can move on to the FastBack 20. this machine creates the book block proper – the meat and body of your body, the text and things like that. So there’s inside covers, you place all your papers in the middle and with a simple binding strip, the machine does all the work itself. And third and final step is using the FastBack HardCover guide, this takes the inside, marries it with the outside perfectly and beautifully. Measuring tools and clamps keep things nice and steady. You can add detail and flare and by simply peeling away backs, the adhesive is exposed. You lay out the book nice and smooth, push it all together and you’re set. There you have it – the Powis Image Wrapper, the FastBack 20 and the FastBack HardCover guide all working together for you. For more detailed how to’s and demos and reviews, check out MyBinding.com. 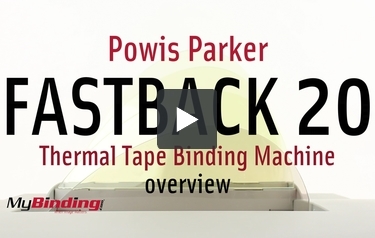 Powis Parker makes some of the most innovative tape binding machines available and one of their best is the brand new Fastback 20. This is an extremely versatile device that can be used in a variety of different workplaces (offices, schools, print shops, etc.) and it's packed with special features. It also happens to be compatible with environmentally friendly binding supplies, so you don't need to feel guilty about binding your documents with it. Continue reading so you can check out the Fastback 20's strengths (and weaknesses) and determine if it's the right device for your binding needs. The Fastback 20 can be used to bind documents of varying sizes and thicknesses. Your document can contain from 10 to 350 pages and narrow, medium, and wide Fastback strips are compatible with this device. Also, the documents can be from 6" to 12" long, so it's really easy to bind letter- and A4-sized work. This is definitely the Fastback machine to use when you're in a hurry. The device only takes 3 minutes to warm up and it can bind a document in 20 seconds or less. This is almost four times faster than using a traditional punch-and-bind device. It's possible to edit documents that have been bound with the Fastback 20. This way, you don't need to totally do things over again if you need to make any changes to your work. The paper supplies used with this machine are environmentally friendly and recyclable so you can reduce your company's carbon footprint. Using this machine is easy because it has a graphical user interface. If you're new to binding, you'll be a pro at it in no time. And if you're already familiar with binding, you'll be pleased to know that this machine is compatible with the FoilFast and Powis printers. Plus, the Fastback 20 has a convenient SD card slot for firmware and software updates in the field. The Fastback 20 is beautifully designed and it will look great in all kinds of workplaces. It comes with a one-year warranty. The Fastback 20 is compatible with Powis Parker Image strips allowing you to create a fully customized look to your bound documents and reports. Using an image strip allows you to brand the spine of your document and to create the impression you desire with your prospective customers and clients. The Fastback 20 is fairly large with dimensions of 23.5" (width) x 9" (height) x 23" (depth). You'll need a fair amount of space for it, so it might not be the best choice for smaller work areas such as cubicles. Unlike its predecessor the Fastback 15xs, the model 20 does not handle legal sized documents. If you need to bind documents longer that 11.7" (A4), this machine probably isn't for you. The Fastback 20 is one of the best tape binding machines on the market and it's definitely the star of Powis Parker's already impressive lineup of document finishing devices. This machine is fast, versatile, and it works with environmentally friendly products. It's also easy to use so anyone needing to bind a document can do so without any trouble. The only thing that could be problematic is this machine's size. However, if you have enough space for it, you're going to love it. Check out the Fastback 20 today! I have a binding strip in the binder how do i open it to retrieve strip. To address technical issues the best first step is to contact the manufacturers technical support department. The manufacturer is Powis Parker and their phone number is 1 (800) 321-2463 . Can I make hardcover books with this machine? Yes, you can. The Fastback 20 is capable of binding documents with both hard and soft covers. This makes the machine very versatile and will enable you to give your work the perfect look it requires. Best of all, the device can bind any document in less than 30 seconds so you can finish your project quickly and you can edit it later on if you need to. I’m looking for a binding method that’s environmentally friendly. Does this device use supplies that are better for the environment than plastic combs? It does. Powis Parker – the company that manufactures the Fastback 20 – is known for making environmentally friendly binding supplies. The strips you use with this device are partly made out of either post-consumer waste or recycled materials. They can also be recycled so you don’t need to worry about the binding sitting in a landfill for a long time. What kind of documents can I bind with the Fastback 20? Just about anything you want. This machine is capable of binding documents that contain as few as 10 pages or as many as 350. You can use it to bind school assignments, financial and/or legal documents, novels, year-end reports, and so on. Your work will look really professional once it’s been bound, so you can use this device for important documents for meetings and such. Can I use this machine to bind a Poly Cover? Thinner poly covers tend to warp when bound with a fastback machine. However we have seen users successfully bind documents with thicker 23 gauge poly covers. If you would like a sample to try in your machine give us a call at 1-800-944-4573 and we can send you a sample of both 23 and 35 gauge poly to see how you like it and to run through your unit.